The North Evo has gone through quite an Evolution from the time it was introduced in 2008. 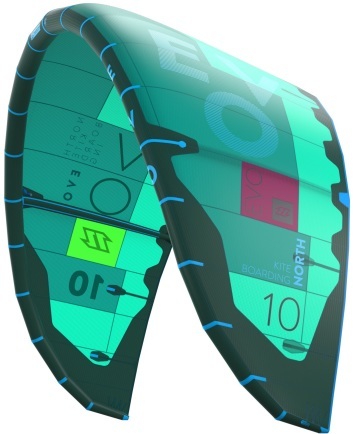 Where it began as a beginner kite in 2008, the 2011 Evo was designed as a one-pump all-rounder. To enable the rider to see what to expect from a kite North uses a kite compass, which gives you a quick overview of the general characteristics. Using the Compass, the Evo shows strong stability (light blue) and good all-round performance by scoring high on many other characteristics. The Evo tries to combine the ease of use and depower of a hybrid kite with the unhooked characteristics of a C-Shape kite. The Evo should provide basics like an easy relaunch, stability and gradual predictable power buildup and a good low-end. The larger sizes in particular should perform well in low-wind conditions. Stability and all-round characteristics are prevalent in the 2011 North Evo (light blue). According to the designers the Evo performs well on a number of characteristics. 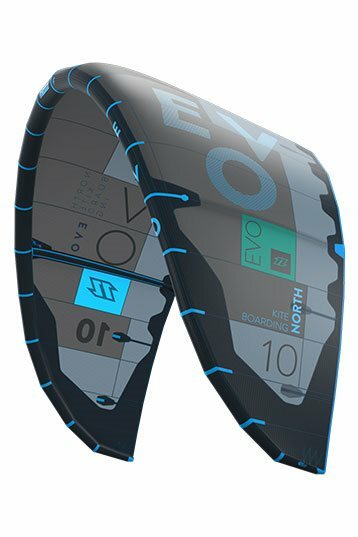 The Evo promises ease of use and depower ability of a hybrid kite combined with the unhooked characteristics of a C-Shape. Basics like the easy re-launch stability and predictable power buildup are complimented by a good low-end. The larger sizes in particular should perform very well in low-wind conditions. Soon after we started testing we noticed that the Evo 2011 has changed from the 2010 model. It offers more performance, is more explosive, has more de-power and positions itself closer to the edge of the wind window. The feedback through the steering lines and the small turning circle has remained. The long depower stroke of the 2010 Evo has been replaced by a shorter stroke, so it is easier for wave riders and riders with short arms. This shorter stroke, however, does give it a different feeling than last years model. The 2011 model is a bit less stable than its predecessor. The loss in stability was caused by the change in profile. This change, however, does offer more range and more depower. Don’t worry, the kite will not drop from the sky in gusty conditions, it is still extremely stable. The canopy has been made of a new material called D2. Because the material will stretch less the kite is supposed to be more durable, but only time will tell if this is true. The 2011 Evo comes with a one pump system. The 2011 Evo will appeal to advanced riders because of the explosiveness and the abundance in pop and control. Compared to the 2010 model you will get a better high end and therefore a larger wind range. The change in profile changed the way this kite feels. Give the 2011 Evo a try and feel the facelift! A bit less stable than the 2010 Evo. Possible due to changed angle of attack (struts/leading edge) The Evo now also positions itself closer to the edge of the wind window. Better than last year. More at the edge of the wind window, likely due to changed angle of attack. A bit less than last year, in part due to shorter depower stroke. All allround kite, for beginners and advanced boarders. This kite is great for beginner and allround riders. 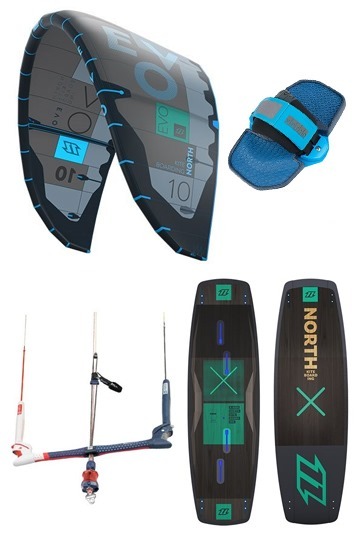 in my opinion its suitable for 60-70% of the kiters because of it's simplicity. easy to handle, great for beginners but not too soft for a intermediat freestyle rider. From practising your first waterstart to the first handlepasses. It is possible with the North Evo. The new D2 foil is very strong. Even if you have a small hole in the material. Just put a little sticker on it and you're going to be safe for a long time. Just because of the double lined foil of North. Bar: The 2011 bar is just great as usualy. In my opinion one of the best, maybe the best safety system on the market. With a nice possibility to ride the kite unhooked with the possibility to pull your safety. A easy to set up kite with a good durability. The only disadvantage is that the kite comparatively is quit expensive. If you can find it second hand or on year, you're doing a great deal. In it's high-end (for me with my 7m at 30 knots) the kite becomes fastly overproportional strong and dangerous. Even though you fully depower it, walking upwind you riding becomes nearly impossible! -for storm riders the Fuse is a better option! Evo 7m 2011 on 19m lines is fast, great set for waveriding. Loses in low wind performance from the 2010 Evo but a better high-end. how much does the 2011 EVO cost ?? I have a 9 and 12m evo 2011. One pump looks very good. Kite feels a bit lighter on the bar as the 2010. I only used the 9 two times in the cold, so I will share my views on the kite when I had some more time on it..
Do you mean with newschool the unhook kind of freestyle? Handle passes with kiteloops? We teach with them for the last years. Why? Good feedback, stable, good relaunch, graduate power buillding en short turning circle. The Evo evolved the last years in a more high performance kite, but still we use it in lessons, because of the performance from the above charasteristics. 2011 I did not try! Is the EVO a good freestyle/newschool kite ? Always ride the evo's, I understand its one pump now, how does it look like? Someone already some experience with that one pump system?